Please fill in your and your friend's information in the below form for Citi Credit Card and/or Citi Ready Credit referral. Referrers must get concurrence from referees to disclose their personal information which are full name and telephone number. Referrers who join Member Get Member program could be current Citibank Customers or non-customers who just applied or have applied for Citi Credit Card or Citi Ready Credit within 1 year counting from the referral date. Referee from the Member Gets Member program via online channel will receive online acquisition promotion, subject to Citi’s terms and conditions. Drone DJI Tello 1 unit valued THB 4,000 is the retail price as of Dec 18’18. Garmin Instinct 1 unit valued THB 11,500 is the retail price as of Dec 18’18. Apple Watch Series 4 (GPS) 1 unit valued THB 14,400 is the retail price as of Dec 18’18. 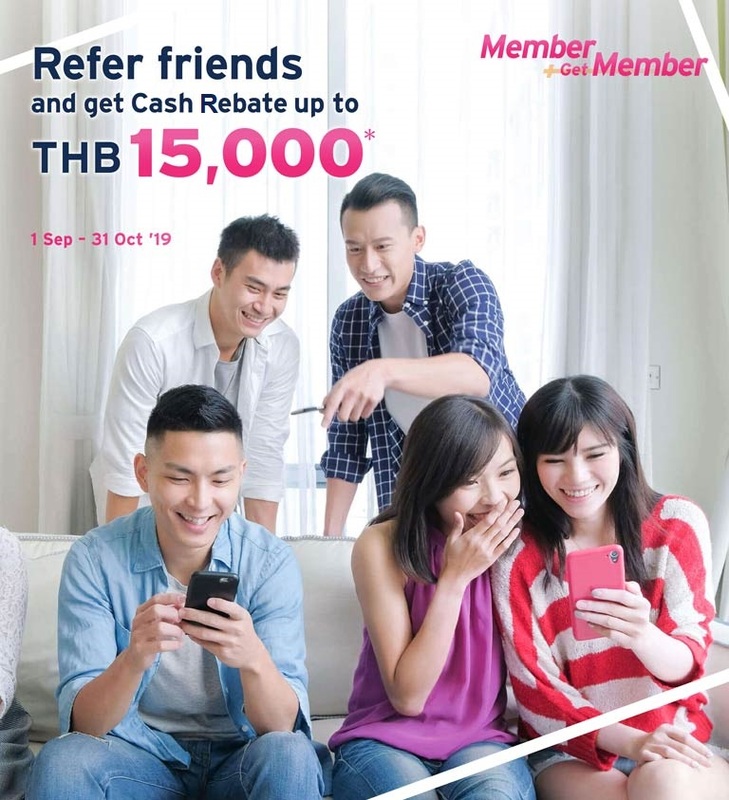 For Tier 1 Rewards, Citi will offer cash rebate of THB 500 or THB 1,000 to referrer’s Citi Credit Card or Citi Ready Credit account depending on the product that Referee applies and gets approved. The cash rebate will be received within 90 days after program end. For Tier 2 Special Rewards, in the case where the referrer earns more than 3 points/ 5 points or 7 points or more, the referrer could receive both Tier 1 and Tier 2 Rewards. For example, if the referrer earns 5 points, the referrer will receive cash rebate or gift voucher depending on the products that the referees apply and get approved according to Table 1 in addition to Special rewards according to Table 2. The referrer must have active Citibank account with good payment record in order to be eligible for cash rebate. The referrer who doesn’t have active Citibank account now but used to apply for Citibank product will instead receive gift voucher or prize with equivalent value instead of cash rebate by post. The referrer who never applies for Citi’s product will not be eligible to receive Rewards under this program. Citi reserves the rights to only consider referees as those who have not currently held any of Citi Credit Cards or Citi Ready Credit and/or must not have cancelled a Citi Credit Cards or Citi Ready Credit for less than 12 months. In the case that the referee has been approved for more than 1 Citi Credit Card / Citi Ready Credit/ Citi Priority or Citigold, the referrer will earn 1 point per 1 referee. This program is reserved for Citi Credit Cards and Citi Ready Credit issued by or Citi Priority and Citigold opened with Citibank, N.A. Bangkok branch only. Referees who apply for Citi Simplicity Credit Card will not be counted as successful referrals under this program. Citi reserves the rights to verify with the referees and do not offer any Rewards to the referrers if the referees do not recognize the referrers. Citi reserves the rights to make final decision which referrer should get cash rebate and/or rewards when there are more than one referrers, referring the same referee. Citibank reserves the rights to withhold any approval status of the referred friends for their confidentiality. Citibank will inform referrers of total numbers of successful referrals of Citi Credit Cards, Citi Ready Credit, Citi Priority, or Citigold. The value of rewards received from participating in the Member Gets Member program, including rewards points earned, gift voucher, cash rebate or merchandise is considered as personal taxable income. Citi is responsible for submitting a withholding tax certificate stating the value of the rewards as your taxable income to The Revenue Department as required by law. It is your responsibility to disclose the source and the value of your additional taxable income, connected with your participation in the program, and submit your tax form. You may request a letter confirming the value of such rewards from Citibank to support your personal income tax clarification. Citi reserves the rights of final decision on any disputes arising out of or in connection with this program. Citi reserves the rights at its absolute discretion to terminate this program or to vary, delete or add to any of these terms and conditions as appropriate without prior notice. The client referral offer is not applicable to referrers and referees if the referee is a resident individual of the European Union, European Economic Area (EEA) or any other jurisdictions where referral activity is restricted. Citi Priority status refers to a customer who has opened deposit and /or investment accounts with new funds with a minimum of THB 1 million but not exceeding THB 5 million. Citigold status refers to a customer who has opened deposit and /or investment accounts with new funds with a minimum of THB 5 million. The referee needs to be a new customer who has never opened a deposit account or invested in Mutual Funds with Citibank, N.A. Bangkok branch. Opening deposit and/or investment accounts with new funds means the source of funds to be deposited and/or invested must solely come from outside Citibank. Funds transferred between Citibank accounts shall not be deemed as new funds. The referee must maintain the Citi Priority or Citigold status, as the case may be, until the day the referrer receives the rewards. A US person is not eligible for this program.